JoeBattlelines: G.I. Joe Daily News, Reviews, and more! A short while ago, I was fortunate to collaborate with Justin “General Hawk” Bell on a joint preview of the 25th Anniversary Scarlett figure. We had each purchased a “pre-production” figure of the team’s signature red-head and decided that it would informative to write an “early look” piece on the figure. Now that I have the 25 th anniversary battle packs in hand, I find that many of my original comments hold true and so I’m going to be excerpting the preview into my review of the figure. (Don’t worry—it’s not a straight rehash.) 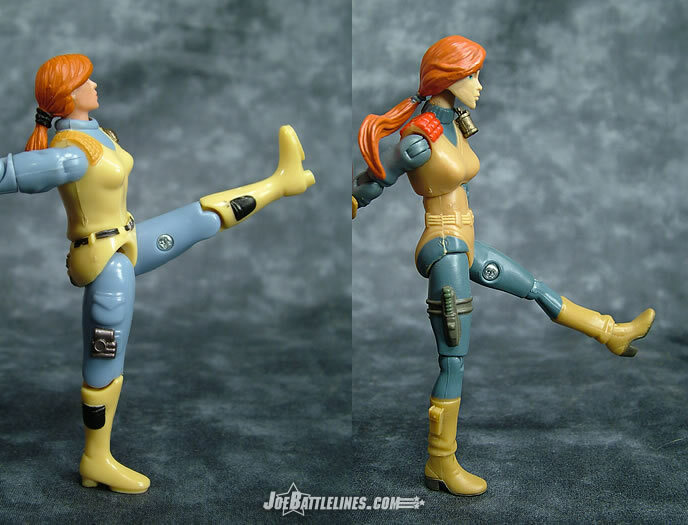 So, read on and see just what one Joe fans thinks of this latest Scarlett figure. 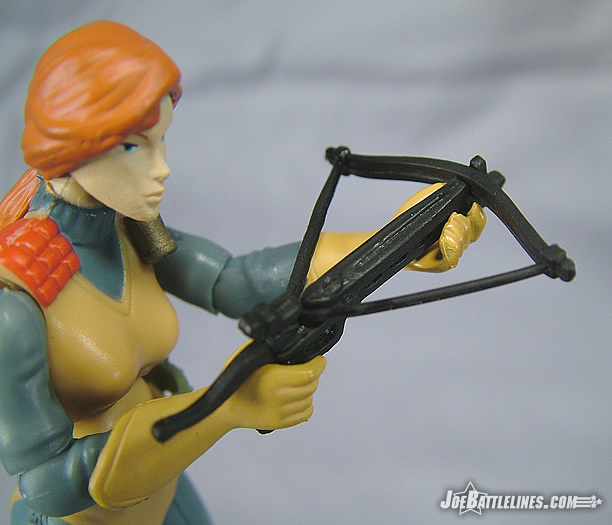 It’s hard to argue with the fact that Hasbro pretty much nailed the classic Scarlett look with this figure. (Okay, almost—but more on that in a moment.) The tan unitard over the blue gray body suit, the padded red panel on the shoulder, the 60’s-esque high heeled boots—all of the defining characteristics of the original Scarlett character design are present in this small piece of plastic. 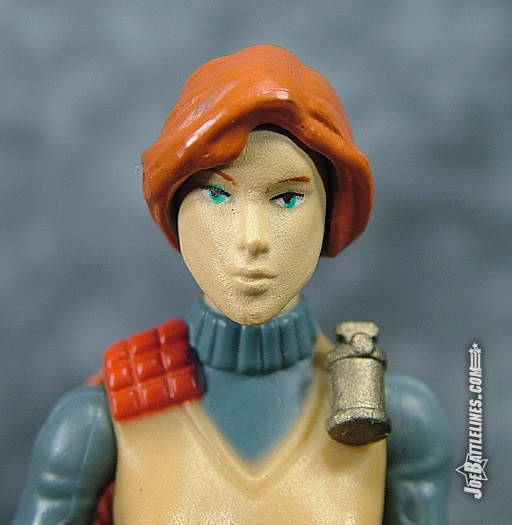 The head sculpt is decidedly animated in nature but I’m under the impression that this line is dedicated to the “definitive” versions of the various characters and Shana O’Hara made a lasting impression on a generation of 80’s cartoon viewers. Unfortunately, with only one figure to examine I can’t speak for how she’ll blend in with the rest of the line but I’ve got ZERO issues with Scarlett taking on a more cartoon-based aspect. In fact, I’m going to state that this is the best Scarlett head sculpt that Hasbro has produced since the line was re-launched. This version is decidedly feminine and yet carries a look of cool intelligence, which is how I’ve always seen the Joe team’s deadly red head. Previous sculpts have either been too young, too old, or too distant in appearance, but this head sculpt nails what I think of when someone mentions Scarlett. In this figure, nearly every aspect of the original character design has been faithfully reproduced in a new-sculpt form. Now, this is where my minor nitpicks come in—and that is that Scarlett is actually missing a few small details that I’d always enjoyed about the original figure. 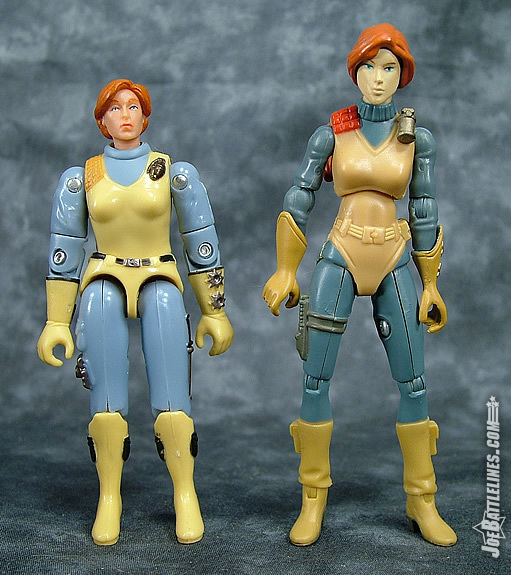 One of my favorite aspects of the original Scarlett figure was the amount of weaponry that was incorporated into her design. I’m not talking about her crossbow but rather all of the various implements of death and destruction that were sculpted onto her combat uniform. Scarlett carried a derringer (inside right glove), a grenade (left shoulder), two shuriken (outside left glove), explosives with detonator (right thigh), a sling shot (posterior), and a small knife (left thigh)—making her someone who was prepared for any eventuality. This new version only has half of the molded detail—the grenade, shuriken, and knife are all still present. Now, this is a minor nitpick but I miss seeing the other “tools of her trade” incorporated into the design. Still, if this is all I’ve got to complain about then this is one solid character design that is sure to please most Joe fans. When I purchased the “preview figure” a month or so ago it was entirely devoid of any accessories. 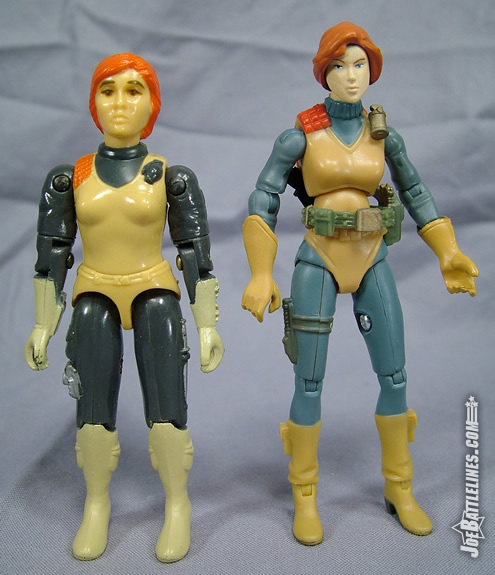 In that intervening period it would seem that Hasbro decided to include a few more “goodies” with Scarlett and so Shana O’Hara was given both a belt and a weapon. 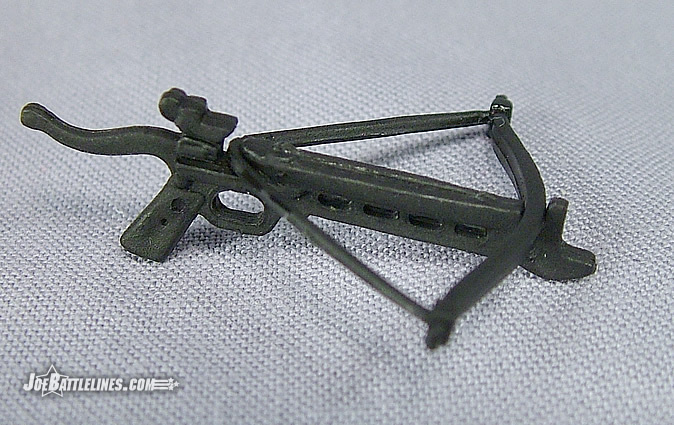 Rather than reuse an existing piece, Hasbro opted for a brand new two piece crossbow—and this might have been a welcome addition if it weren’t so flimsy. As I mentioned, the crossbow is comprised of two separate pieces- the stock and bow. In theory the bow sits on the stock by means of a slot near its center and is held in place by the attachment of the “bow string” to the firing mechanism on the stock. In reality the two pieces fly apart at anything more than a casual glance. Also, the relatively rubbery nature of Scarlett’s hands makes it all but impossible to easily achieve any sort of dynamic pose with the weapon. Simply put, either her hands prove incapable of a solid grip or the bow separates from the stock and the pieces drop to the floor. The only way to fix this is with two strategically placed drops of glue—otherwise the parts will become lost and Scarlett will find herself armed with a stern gaze and some harsh language. The added belt is a nice detail or at least it would be if it actually fit the figure. 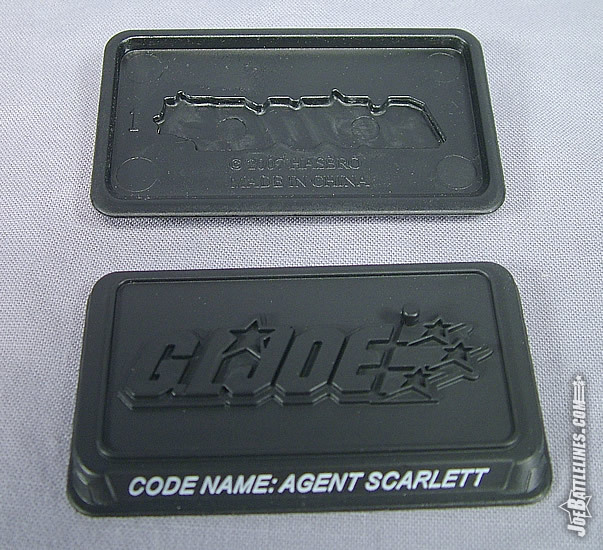 The design for Scarlett’s mold already included a sculpted belt and so the accessory belt has to sit on top of it. The result is one accessory that simply rides up over the molding giving Shana a “high water” look that is neither practical nor flattering. 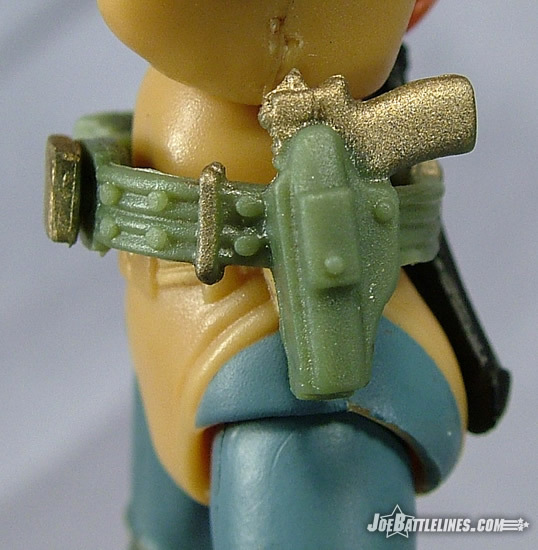 This is a shame as the belt features a sculpted quarrel along the back and a gold pistol holstered on the left side. It’s just another example of what appears to be a gross lack of attention to detail in this entire line and one that makes me wonder just how much “over-hauling” subsequent waves will see. 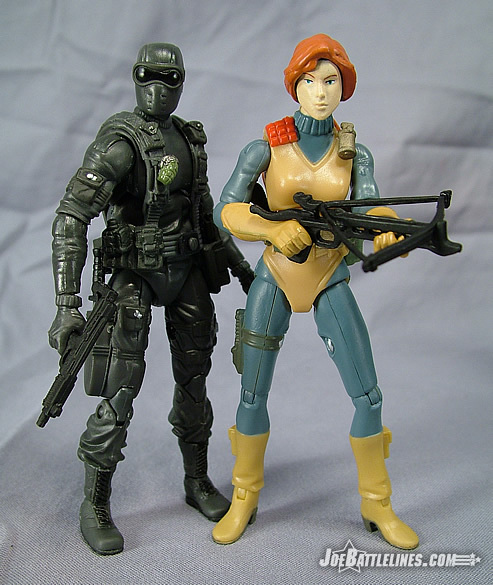 I’m an articulation junkie—which is what drew me away from Star Wars and toward GIJoe as a child. It’s also what led me to the Marvel Legends line in later years. I like my figures to be “action figures”—poseable representations of favorite characters. The more useful articulation in a figure, the more I find that I’m predisposed to like it. From the waist up, Scarlett gets some pretty decent marks in the articulation department. The “new elbows” that debuted back in Valor vs. Venom are still present as are the standard ball-jointed shoulders. Scarlett’s gloves swivel which opens up a whole new range of options in terms of poses she can hold. The ball-jointed neck works okay but doesn’t really offer anything too ground-breaking in terms of movement. Unlike Justin, I’m a bit ambivalent when it comes to the new torso joint. Perhaps it’s the placement in the torso that throws it off but I don’t see a huge advantage. Scarlett can now droop forward a bit but that’s about it. It does, however, alleviate some of the problem found in the waist articulation. Without this torso joint, Shana O’Hara wouldn’t be able to sit down with any degree of believability. Here’s a good rule of thumb: if you’re going to change a proven design, make certain that the new design at least works as well as its predecessor. I’ll be blunt—the new waist is everything that fans feared it might be when pictures of the anniversary figures first appeared. A standing classic RAH-era or GvC-era Joe can typically raise their leg up to their waist, parallel to the floor. The new 25th Scarlett isn’t so limber and can only manage to raise her leg as high as her own knee. The result of this of restriction in range of motion is that Scarlett is incapable of sitting up in seated position. She can slouch (with the help of her new mid-torso joint) like a college student in a particularly monotonous 8am lecture, but there is no way she’s going to sit up straight. 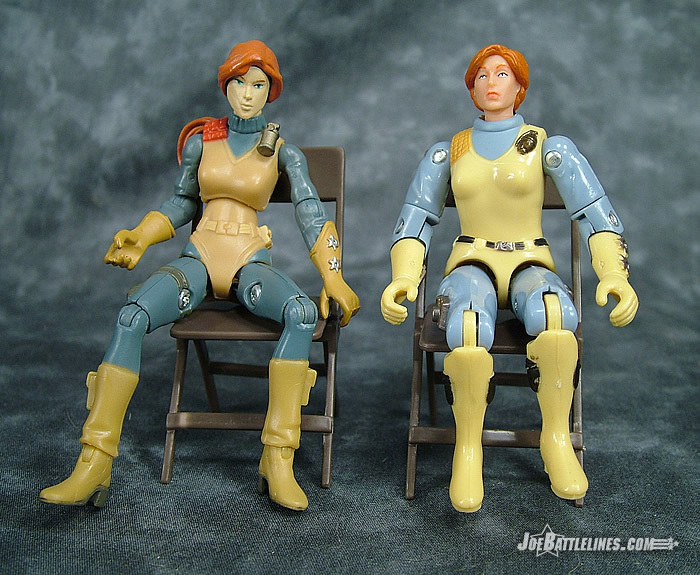 This means that Scarlett doesn’t work well with classic RAH-era vehicles like the RAM or even the seats in the 1983 Headquarters. She can sit down alright but she’s got nowhere near the range of motion of the figures that have come before her and that, to me, is a real failure in design. She also cannot sit with her knees together as the new waist piece is simply too thick in the crotch to allow for a formal sitting position. Apparently Shana skipped charm school because when she’s seated, she’s one of the guys. (Essentially, she’s got a “v-crotch”.) I don’t know how this oversight was allowed to get as far as it has in the design process as it seems that no one really sat down and tested the full range of motion on the figure before putting them into production. Sure, I love the fact that she can hold many a weapon in a proper two-handed grip but I’m not crazy about the fact that I have to really work to get her into many of my classic vehicles. A great many people have compared this line to the Microman line from Japan and while there are some similarities, it’s not even close to the range of motion achieved both those figures. 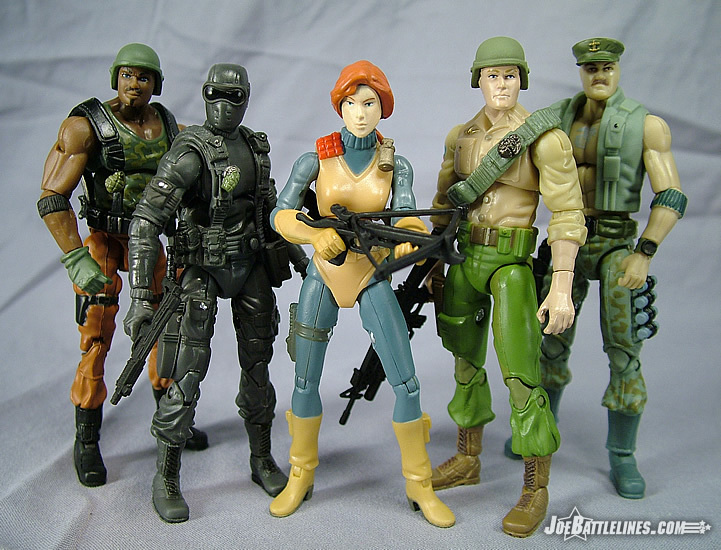 I can only hope that Hasbro learns from the first few waves of this line and at least restores the range of motion found in the previous incarnations of GIJoe: A Real American Hero. Okay, rant over. The 25th Scarlett represents the beginning of something really exciting—the potential for a whole new era of GIJoe: A Real American Hero. A new body construction, new sculpts, new classic packaging—of these aspects could prove to be the “shot in the arm” that many have felt the line needed. While heavily tied to the past, this line has the potential to innovate in ways we haven’t previously seen. This figure, however, represents a concept that was possibly rushed into production. While the level of sculpting is really quite terrific, creating a figure that could have literally stepped right out of the classic card art of the 80’s, the restricted movement of the waist and hips leaves me a bit cold. 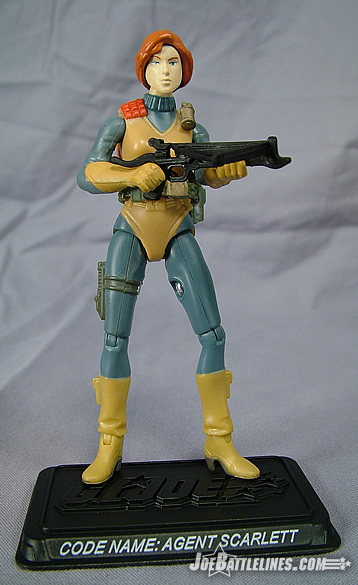 If this figure at least had the same range of motion of the original 1982 version, I’d proclaim this hands-down the best Scarlett figure ever produced by Hasbro. However, I find myself stopping short of such a proclamation of greatness. It’s as if Hasbro ran the Boston Marathon leading the pack and then decided that they were close enough at the 22.5 mile mark. The inability to sit is the real issue for me—not the change in scale or any other such nonsense. I had originally stated that these oversights in design wouldn’t keep me from passing on the line but the further I delved into the first figure battle pack it became more and more obvious that this line just wasn’t properly thought out. Unless Hasbro doesn’t some major quick-stepping and fixes the plethora of oversights that plague this first set, the 25 th Anniversary line could very well end with a resounding “thud”—straight into clearance bins by years end. If the line isn’t designed with children in mind and the design issues turn away collectors, just who is going to buy these?